One day during the next week I plan to make a trip to Hearne Hardwoods and pick up some actual nice material for woodworking. For the past year I’ve been using nothing but Poplar and Pine and I’m at the point where I’m looking to break up the monotony a little bit and try something new. A few days ago I had written a post about not only making a Stickley #79 magazine cabinet, but also a Shaker Enfield Cupboard. For the Stickley piece I plan on using White Oak, which would be true to the original, but the cupboard is another matter. Originally, the cupboard was made with Pine, just like a good majority of Shaker furniture was made. Most of the examples I’ve seen also have been made with Pine. Though I’m sick of using Pine in a big way, I would like to paint this cupboard, and it seems really stupid to use a nice hardwood only to cover it up with paint. Of course I could, and probably should use Poplar, but as far as wood grades are concerned that is like trading up from a Pinto to a LeCar. And using an exotic wood on a Shaker project seems out of place, and would probably look a bit ostentatious. So it looks like I will use Pine or Poplar for at least one more project. The problem is that furniture made from “fancy” woods such as Mahogany just wouldn’t look right in my house, and practical woods such as Pine and Oak seem to fit the Bill, both literally and figuratively. Worst of all, I have a little money to spend, and I’m going to a hardwood dealer that has just about anything you could ever ask for. When a woodworker goes to a place such as Hearne he doesn’t want to come back with Pine and Poplar and Oak, he wants to come back with wood from an exotic tree you would find in a Tolkien story. For once in my life I’ve managed a champagne budget for the material I want, but I still have beer taste when it comes to what I want to build with it. The definition of ‘me time’ varies from marriage to marriage. For example, ‘me time’ for my wife may be dinner and a movie with her friends, or maybe a trip to the mall with her mom. On the other hand, her definition of ‘me time’ for yours truly is the 40 minutes I commute to work in the morning, or possibly when I cut the grass. Still, I do get a little bit of time to myself on the increasingly rare occasions when I get to woodwork. Yet even then, I was more than likely working on a project for my wife, or one that she reluctantly sanctioned in her infinite wisdom. The other day, I had mentioned in a post that the next piece of furniture I build will be for me, not because I need it, or because my wife likes it, but just because it’s something I want to build. I think I may have found that piece of furniture. 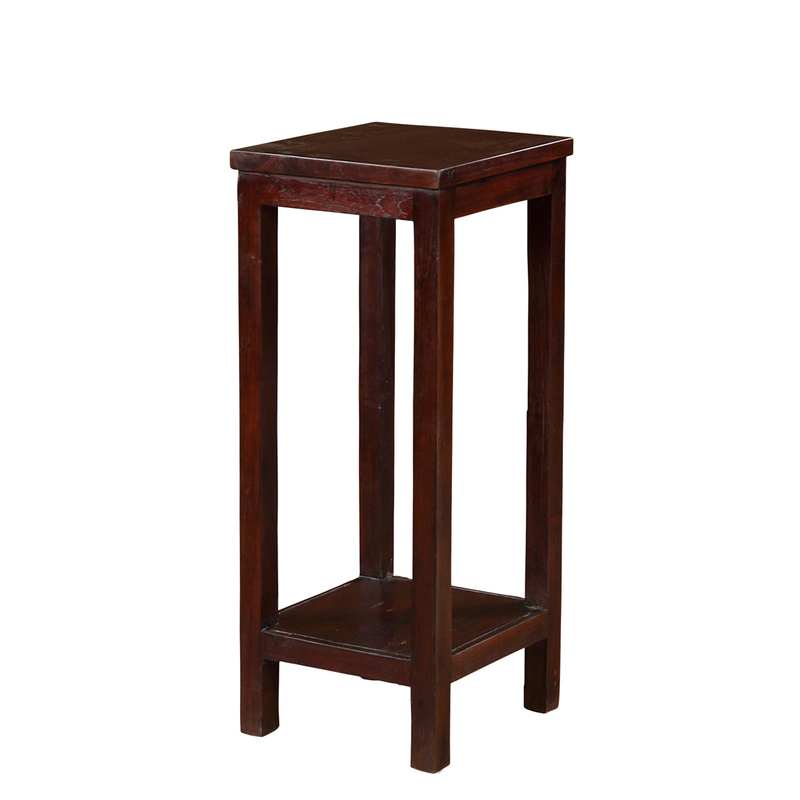 I like Stickley furniture. It is solid, straightforward to build, and works well in my house. I like bookcases and magazine cabinets, and Stickley had several nice ones to choose from. One of the first real furniture projects I ever made was the Stickley #72 magazine cabinet. It is to this day my wife’s favorite project of mine, and I think it’s pretty okay, too. 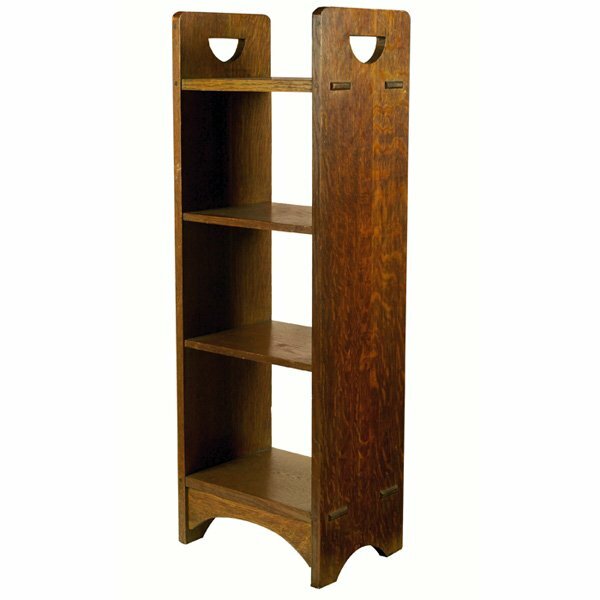 But before I made the decision to build it I very nearly chose another Stickley piece, which was the #79 magazine cabinet. I can’t recall exactly what made me change my mind at the last minute, but I did, and I don’t regret my decision. However, the #79 was always on the back of my mind, not only because I like the look of the cabinet, but because I have several places in my house where it will work perfectly. Maybe most importantly, I checked the small stash of Walnut I’ve been saving forever and it looks like I actually have enough to build that cabinet from, if not, I will go to the lumberyard and get enough. This time, I’m not going to compromise. Though I generally don’t follow woodworking plans, I will use one as a rough guideline in this instance. The plan comes from the now defunct Woodworking Magazine and is an interpretation of the original design with some slight modifications. The original design has through tenons, the plan does not. Though I like through tenons, I won’t use them on the cabinet either, as I was planning on fastening the shelves into the dadoes with decorative cut nails. Also, the plans call for the decorative arch at the bottom as well as two cross-cleats in the back which help stiffen the case while not being very noticeable. The decorative arch is certainly on the original, but I cannot tell if the cross cleats are there, though I will add them all, the only change being the way they are joined to the cabinet. The plans call for using pocket screws, but I’m not necessarily sure if I want to use them. I’m not a pocket screw snob, not in the least, but I think they have a time and a place. For the cross supports they will likely work fine, but for the decorative arch, I may want to use a mortise and tenon. The problem with that is the fact that there really isn’t much to tenon into. The sides of the case are only 7/8 of an inch wide. I suppose a 7/16 deep tenon is good enough, but that is something I will have to research before I make a decision. The only think I really have left to do is check my stock and start building it. I had mentioned in a previous post that I really don’t plan on making furniture this summer, mostly because of the hot and humid weather. I will probably stick to my guns there. If I do have enough Walnut to make the stand I will at least know that it’s seasoned and stable. If I have to buy new wood I will have to let it acclimate, which will obviously take some time. I don’t plan on rushing anything. I may work on it an hour here and an hour there, but I’m in no hurry. I’m going to take it easy and enjoy the experience. I may change things up, or stick directly to the plans, or go in a completely new direction. It doesn’t matter! This is my ‘me time’, and I plan on enjoying it even if it kills me. Yesterday morning the sun rose once again and brought with it one of the nicer days we’ve had in some time. Among other things, I took the time to run some Walnut through my surface planer, which I was able to do in my back yard because of the nice weather. I did not end up with as much usable stock as I would have liked, though there should be enough to make the plant stand I am currently planning. Still, I have some nice boards to work with, and if worse comes to worse I should be able to pick up a piece of Walnut without too much of a hassle. As far as the design is concerned, I’m pretty much set on the dimensions and the overall look of the stand, but there is one feature that I am still undecided on, and that is whether or not I should bead the legs. I mocked up a couple of legs with some scrap and ran a full bead on them and I still don’t know which direction to go in. I like to chamfer the bottom of table legs, in particular when they are stockier in size, like the legs of the plant stand will be. When I ran the full bead it just does not work with chamfered leg bottoms. I made several attempts to clean it up using chisels and a saw, but no matter what I did it ended up looking half-cocked. I suppose I could pick up a larger beading bit and see if that changes things as I currently only have a 1/4″ bead for my router, and router bits are relatively inexpensive. In the end, I think I’m going to give the full bead a try. I’ve made five tables and each of them has chamfered bottoms and three of them have stopped chamfers. It’s about time I try something new. I think the beaded legs will look nice with a slight taper added, and make the stand “stand out” from some of the other furniture I’ve made recently. And if the look doesn’t turn out exactly how I would like, I’ll chalk it up to a learning experience, besides that, the plant won’t care one way or the other. I finished off the woodworking portion of my weekend by sharpening my wood plane irons (all Hock) which was a nice experience, and then sharpening my two Narex skew chisels, which wasn’t so pleasant. The Narex steel sharpens just fine, but the bulky handles make the sharpening jig tippy, and I am not about to sharpen a skewed iron free hand; I don’t have the skills for it. Otherwise, I managed to get a decent amount of work done in a relatively short amount of time. Before I put everything away I cut the Walnut to rough lengths and stacked it. Lastly, I washed and waxed my wife’s car, not that it matters all that much, it will look like it she drove it off a cliff after her first drive in it. I don’t know what it is, but women and clean cars don’t mix. Before I begin a new project I usually do an exhaustive amount of research. This usually includes going through furniture books, scouring the internet looking at photos, taking measurements, and drawing many rough sketches. This process becomes even longer when I am undecided on what exactly I would like to make. During those times I am comparing sketches, wood costs, material needed, and time frames. My methods tend to be very scholarly and cerebral. So the other night I was watching a movie on TV, I think it was Porky’s, and I happened to notice a plant stand that I really liked. Just after the shower scene it occurred to me that a plant stand would look pretty nice in a conspicuously empty corner of the living room of our house. I did a quick inventory of a small stash of Walnut I have and found more than enough to make the stand as well as another smaller project I had in mind. Originally, my wife had wanted me to make a leaning shelf for that corner, but I wasn’t too keen on the idea. A shelf in that location would have looked out of place in my opinion; the corner is too small for a larger shelf that would actually be able to hold anything of substance, and too large for a regular sized table. A plant stand seems to fall into the Goldilocks zone: tall enough to fill in the corner, yet small enough to fit without over-crowding the space. Best of all, my wife was surprisingly enthusiastic about the idea, though I had to tell her that there would be no drawer installed no matter what. I don’t have any project plans to reference for the stand, just a few ideas in my head and a few photos I’ve found thus far. I have come across a few Arts and Crafts style stands both in books and on the net, but I’m trying to stay away from A&C in this case. I caught an episode of The Woodwright’s Shop a week or so ago and wacky woodworker Roy Underhill was demonstrating running full beads for case sides and legs. I thought that a fully beaded leg with a slight taper would look nice in conjunction with a beaded apron, so I did a few experiments with full beading on some scrap wood I have(I will post photos later-camera died) Of course a bottom shelf is going to be a requirement, if for no other reason than to help give the stand a more stout appearance, as some of the examples I’ve seen tended to look a little flimsy. The joinery should be easy enough: sixteen mortise and tenons, and some dados for clips to hold the shelf and table tops to the aprons. First thing I need to do is mill up the Walnut when I get the time, the weather still isn’t cooperating, and then sketch up a few design ideas along with dimensions for the stand. I’m going to have to glue up the Walnut in order to get the thickness I need for the legs unless I come across some thicker stock in my travels. I will also likely have to glue up a piece to get the width needed for the table top and shelf, as I don’t think I will be able to get enough width out of the pieces I do have. So this should be a fun project. It will include some hand tool and some power tool work, a little joinery here and there, and a chance to experiment with decorative elements on an original design. 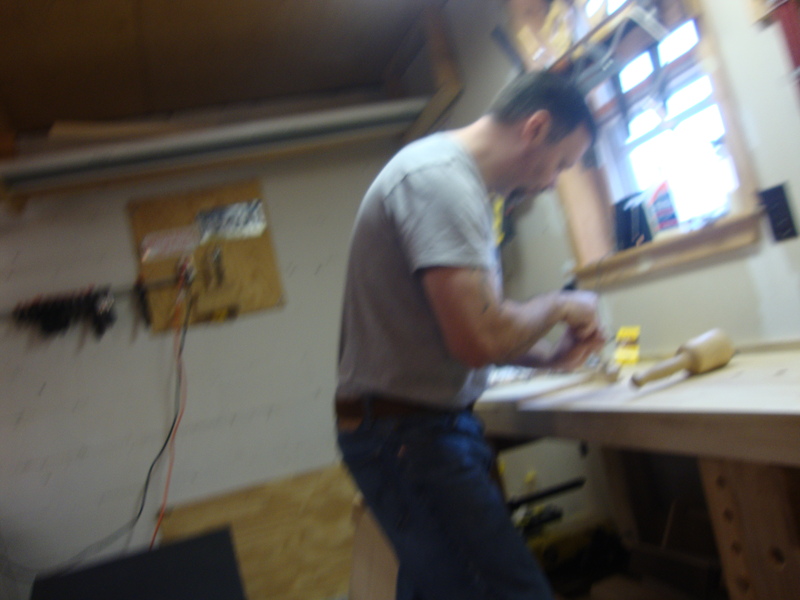 Man, I nearly sound like a real woodworker! October 24, 2013 8:02 pm / 5 Comments on Chest augmentation. 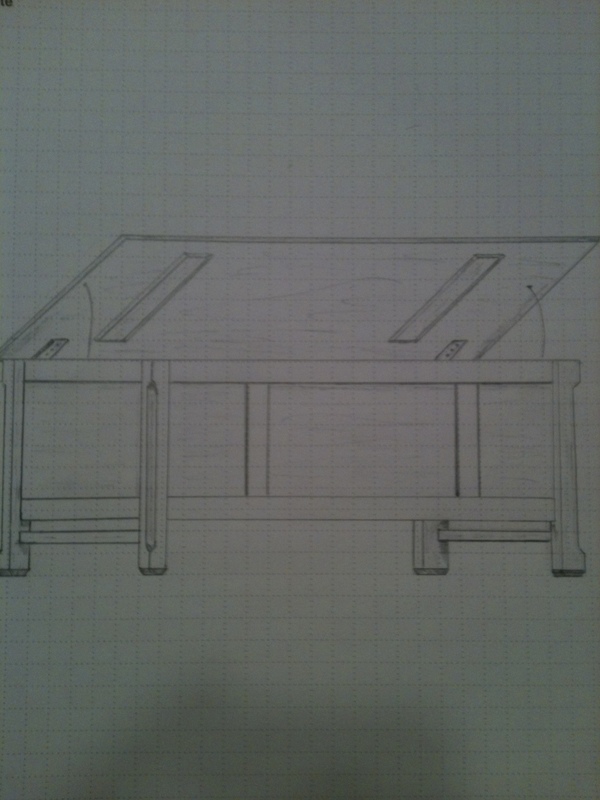 Tonight after work I completed my final sketch/design for my blanket and/or toy chest project. I’ve come up with a final dimension of 23 inches deep x 46 inches wide x 28 inches tall. I’ve added one new design feature that wasn’t included on my original sketch, and that is panels. But the truth is that the chest will not be paneled, and the rails and stiles will just be decorative 1/4 inch thick strips. Why include panels as fake as Pamela Anderson’s rack on a perfectly good and simple design? If you must know it is because of an episode of The New Yankee Workshop I watched online just the other day. Though this chest isn’t an Arts & Crafts design, I was hoping to incorporate some A&C design elements. On the New Yankee Workshop episode, Norm built a replica of a Stickley original desk which just so happened to incorporate panels in the design. Since my chest design looks somewhat like a squashed desk, and since I really like Arts and Crafts furniture, I thought the faux panels may be a nice touch, and also do something to set the chest apart. So I drew up another sketch which included the fake panels, and on paper it looks like it may just work. Of course, Communism, friends with benefits, and the Phillies outfield also seem like they should work on paper. So before I commit to the idea completely I’m going to mock it up and see what’s what. Another option would be to just make the chest using actual panels which is a proven design element. I considered that, and while it wouldn’t really change the dimensions or overall look of the chest all that much, it would more than double the material cost if I wanted to do it properly; I’ll pass on that. If this one turns out okay, my next chest will get all the bells and whistles. So the design is set and I have the material ready to go. I plan to begin on Saturday afternoon (I have work in the morning) starting with the legs. I hope to get the mortises finished, along with the chamfers on the feet and on the leg sides. Sunday morning I hope to get the side panels dadoed and ready to receive the chest bottom. I am guessing at around two hours each day. With those operations completed the rest of the chest should go together quickly and painlessly, on paper. If this chest build goes well I will have a proven design under my belt for future use, and more importantly it will get my wife off my back for the time being and give me the trump card I need to build my Arts & Crafts side table without any grief. That all sounds like a good plan, on paper. I’ve always considered chests the work van of the furniture world; they do a great job of holding things, but essentially it’s a large box that looks like a large box. Traditionally chests were painted, or decorated with ornate carvings and/or mouldings in order to take some of the blandness out of them. Because I don’t like ornate mouldings, and I have no carving tools or experience using them, in order for me to decorate a chest I either need to paint it, or change the design slightly more to my suiting. So today, I sketched my initial idea for a toy/blanket chest for my daughter’s bedroom. If the drawing seems a bit familiar to those of you who read this blog on a somewhat regular basis you would be correct in that assumption. I basically took a page from the Arts & Crafts handbook, along with the sideboard table I desperately want to build, and came up with an idea for a chest that I believe would work like a traditional chest should, but at the same time please my sense of furniture proportion. I haven’t as of yet come up with any final dimensions, but I am leaning towards a chest 30 inches tall, 47 inches wide, and 23 inches deep. Before I commit to that I need to take a few more measurements in my daughters bedroom to be sure that the space allocated for it will be sufficient. As far as construction details are concerned, I will use dado joinery for the case, probably along with a few pocket screws to basically act as clamps. The two decorative bottom stretchers will use mortise and tenon joinery. I will more than likely add stopped chamfers on the legs to soften them and keep the corners dulled, and the lid will have a traditional cove moulding to set it apart just a bit. I’m trying to work out a way to get some decorative head cut nails into the mix. 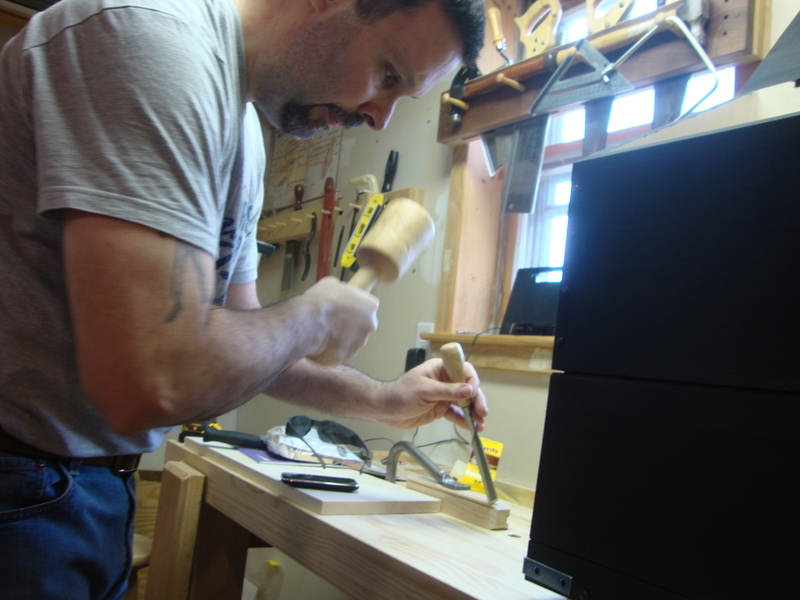 Because the case will be held with dados and glued to the legs, I cannot technically use nails. But a few strategically placed nails could be used for decorative effect, possibly something similar to the ebony pegs used in the Greene and Greene style. While I don’t think anybody would consider this design an Arts & Crafts piece, I honestly believe it could be in the spirit of it, with just a few of the right touches added that is. While I don’t anticipate this being a technically difficult build, I also don’t think it will be quick and easy. The little details that make all the difference will take time to do correctly. 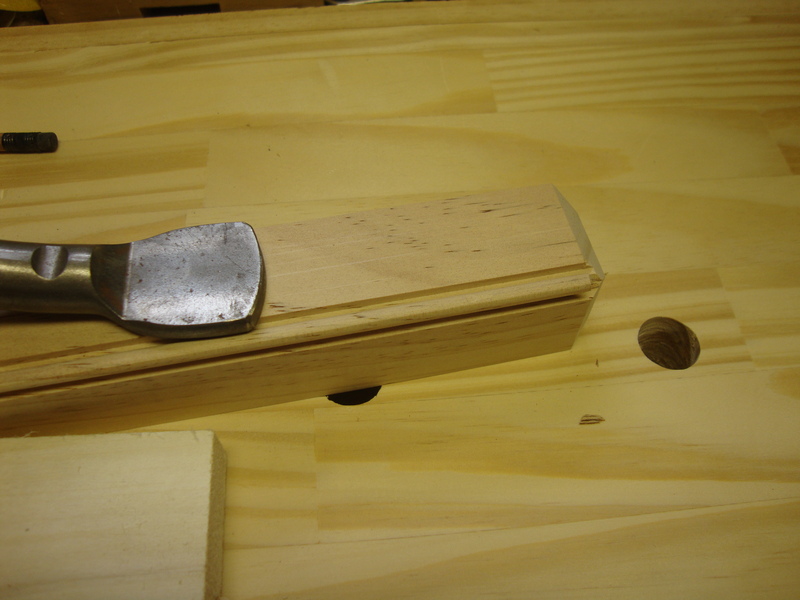 There will be some hand plane, spoke shave, and chisel work; I will probably use a router to make the cove on the lid, and the decorative stretchers will need to have tenons added as well as delicately rounded over to offset them from the square legs. Right now I’m going to guess at around 20 hours of bench time including prep work. The finishing time will vary depending on the choice, either paint or stain. The only real choice I have left to make is which material to use. It will be either birch plywood or edge glue panels, with the legs and the lid being pine either way. The plywood is maybe more cost effective, and certainly more stable, but I won’t make that decision until I know for sure what I am actually spending. So this chest will be my next project. 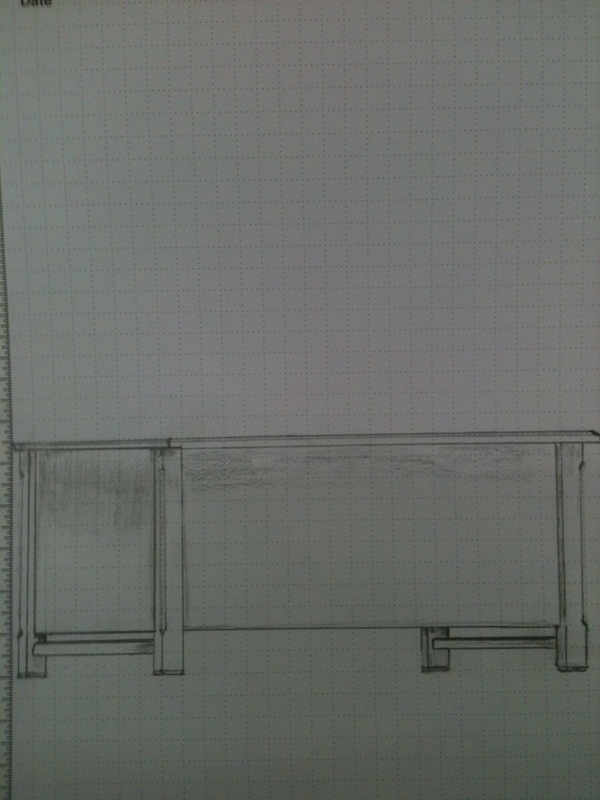 I need to make one more drawing, which I will do after I take my final measurements. With those measurements I can transfer the proportions to the graph paper, and that will give me a good guideline during the actual build. I have a very good feeling about this one, and I think it’s going to turn out nicely. In fact, I have a strong feeling that once it’s finished my wife is going to try to claim it for her own. I’ll try to remind her that I also have an idea for another chest (not Kate Upton’s unfortunately). That second chest may be her Christmas present, and getting the opportunity to build it may be mine.